inscribed with title below image: Sauvage de l’Île Van Diemen (canal de D’Entrecasteaux). The original outline pencil sketch of this man is lot 5b in this auction. A magnificent and detailed portrait of a Tasmanian man in striking profile. Although Péron and many of the other journalists on board noted that a large number of the Tasmanian men they interviewed were naked, the present example shows a mature and initiated man not only wearing the familiar kangaroo-skin cloak, but with a matched headband as well. As in most of the gouaches in Le Havre, Petit has not added any background detail (not even some simple foliage), which gives such portraits a dramatic focus. 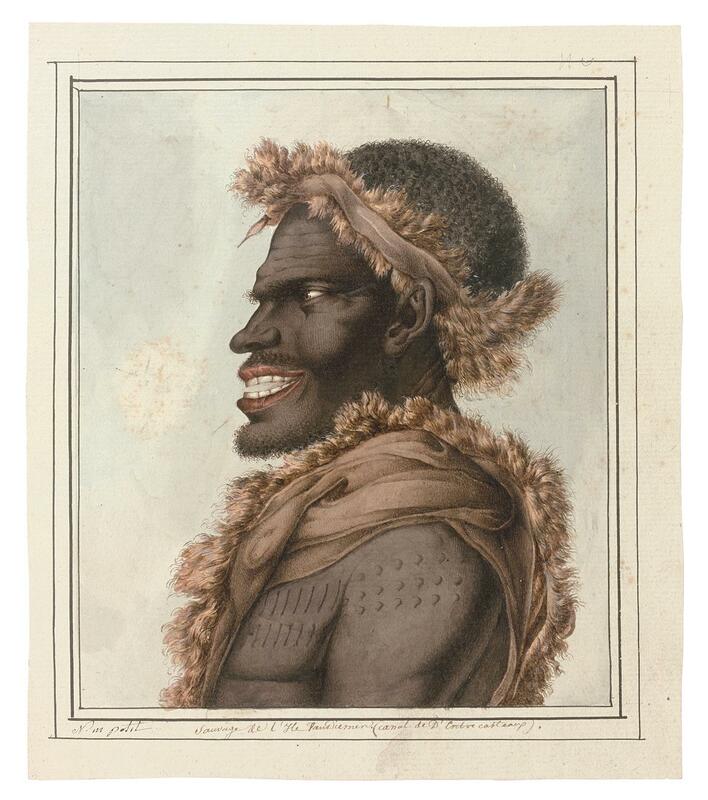 The portrait has a number of precisely observed details of dress and scarification, not only the elaborate clothing, but the man’s full beard, his prominent and dazzlingly white teeth (the remarkably good teeth of the Tasmanians were much commented on by many of the French officers and savants), the hazel eyes, and particularly the scars (short vertical lines on the chest, round dots on the upper arms). As we discuss in the introduction to the Tasmanian section in the accompanying publication (pp. 29-31), one of the most important aspects of this portrait is that it includes a detailed caption identifying the man as a “sauvage de l’Île Van Diemen (Canal de D’Entrecasteaux)”.We take this precise wording to show Petit identifying the location, using the reference to the D’Entrecasteaux Channel to pinpoint the general region, and “Île Van Diemen” as a specific reference to the mainland (and not, that is, the more frequently used “Terre de Diemen”, which the French use to refer to the entire region including the outlying islands). The only major interaction between the French and the Tasmanians on the mainland is that which took place at North West Bay, where the two ships were anchored from 19 January to 5 February 1802, and where the astronomer Bernier set up his observatory tent on a tiny island near the shore. Bernier, and one of the officers appointed to assist him, Saint-Cricq, both reported having extensive meetings with a group of some 40 people including women and children, and our pictures presumably relate to this interaction (and would therefore be the only confirmed record of that period, given none of Petit’s other works include any similar reference to the Île Van Diemen). This hypothesis, we further suspect, has its strongest support in the gouache with mountainous background (lot 8): it is unlikely that the mountainous range dominating the background could be part of the topography of either Bruny or Maria islands. No full portrait of this man was ever published but that one was planned is clear from the collections in Le Havre, which include both a pencil and charcoal sketch by Petit (B:20014.1), while the man is also figured on a corresponding ink drawing on brown tracing paper (B:20014.2).